The Heikegani are a formidable force and should not be trifled with… unless you have a little melted butter. Notice the face of the samurai! 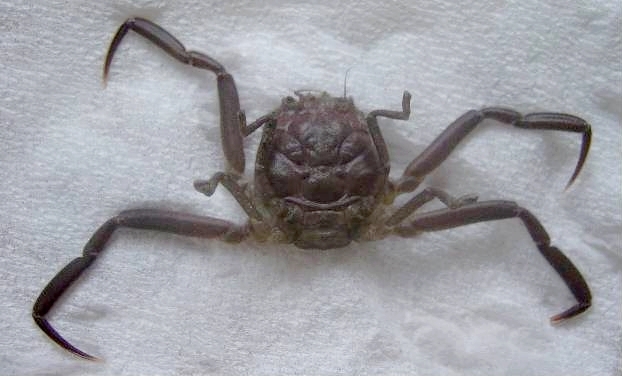 Heikegani (平家蟹, ヘイケガニ, Heikeopsis japonica) is a species of crab native to Japan, with a shell that bears a pattern resembling a human face which many believed to be the face of an angry samurai hence the nickname Samurai Crab. It is locally believed that these crabs are reincarnations of the spirits of the Heike warriors defeated at the Battle of Dan-no-ura as told in The Tale of the Heike. The battle of Dan-no-ura was preceded by an immense struggle between the imperial rulers of Japan, the Taira clan (later known as Heike), who the Heikegani crabs are named after, and the Minamoto clan (Genji), who were fighting for control of the throne at the end of the 12th century in the Genpei War (1180-1185). On 24 the April, 1185 AD, the two powerful Samurai clans fought to the death on the Dan-no-ura bay of Japan’s Inland Sea. The ruling Taira clan (Heike), was led by their child-Emperor, Antoku, and his grandmother. The Heike had ruled for many decades, but now, massively outnumbered, they faced defeat at the hands of the Minamoto. During the battle, a member of the royal household took the seven-year-old Emperor Antoku and plunged with him into the water in the Shimonoseki Straits, drowning the child emperor, rather than allowing him to be captured by the opposing forces. His mother and grandmother followed him in their grief. Antoku came to be worshipped as Mizu-no-kami (“god of water”). This crucial battle was a cultural and political turning point in Japanese history: Minamoto Yoritomo became the first Shogun, or military ruler, of Japan. Dan-no-ura marked the beginning of seven centuries, in which Japan was ruled by warriors and Shoguns instead of Emperors and aristocrats. Heikegani were used by Carl Sagan in his popular science television series Cosmos: A Personal Voyage as an example of unintentional artificial selection, an interpretation published by Julian Huxley in 1952. According to this hypothesis, the crabs with shells resembling Samurai were thrown back to the sea by fishermen out of respect for the Heike warriors, while those not resembling Samurai were eaten, giving the former a greater chance of reproducing. Thus, the more closely the crabs resemble a samurai face, the more likely they would be spared and thrown back. This idea has met with some skepticism, as noted by Joel W. Martin. He posits that humans don’t use heikegani for food, and as such there is no artificial pressure favoring face-like shell patterns, contrary to Sagan’s implication. The pattern of ridges on the carapace serves a very functional purpose as sites of muscle attachment. Similar patterns are found on species in many parts of the world, including fossil remains. More on the Heikegani here on Wikipedia.